I always have good intensions — such as putting up pictures and writing a detailed account of our day. But then we get back to our hotel — after shepherding pilgrims through many holy sites, not including meals and more — followed by a wonderful dinner and delightful conversation — and we crash into bed! 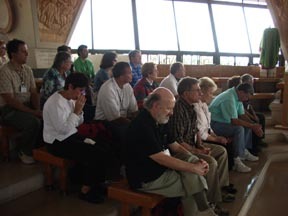 Today (Wednesday) we started early, after breakfast, for Mass at the House of St. Peter in Capernaum after which I gave a defense of the Eucharist in the ancient synagogue in the very place where Jesus taught that must "eat his Flesh and drink his Blood." 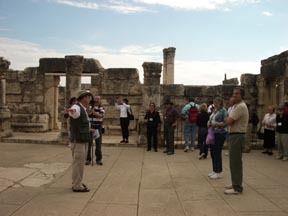 Then to Tabgha where Jesus multiplied the loaves and fishes. After that to the Primacy of St. Peter Church (John 21) where Jesus appointed Peter to feed and tend (teach and govern) his flock. I gave another lengthy talk here. 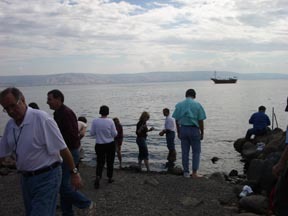 After wading in the Sea of Galilee we boarded the bus for Nof Ginosar to see the Ancient 1st century "Jesus Boat" where we also boarded a modern boat to cross the Sea of Galilee for a lunch of St. Peter's fish in the Kibbutz En Gev. Then to Kursi where Jesus cast the demons into pigs who then hurled themselves into the sea. 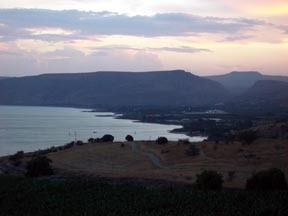 W e drove into the Golan Heights to visit the Yarden Winery and then back to the Mount of Beatitudes where Jesus preached his Sermon on the Mount. A group of Korean nuns were siing like angels in the church as the setting sun provided a spectacular sunset over the hill where Jesus taught. 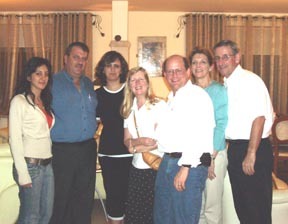 Dinner was had back at the hotel — but Janet and I, along with another Knight and Lady of the Holy Sepulchre, Jim and Cathy McConn, ate dinner in Nazareth in the home of our friend — Amer Shehadeh and his family. One of the most exquisite and delicious Middle Eastern meals we've had. 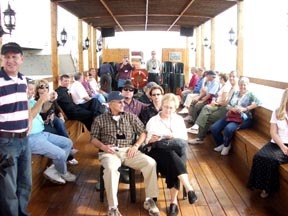 Then a taxi with a Christian driver back to Tiberias to fall exhausted into bed.